Posted 6/20/2017 2:25pm by Jeff Schrimmer. I remember the first time I tasted fresh peas; it was something of a revelation to me. Raised on canned veggies, peas were something I particularly detested and I shoveled them on to my sister plate when she wasn’t looking. Walking in a friend’s garden we pulled some from the vine opened the pods and popped them in our mouths. Wow! I had never tasted anything (or at least any vegetable) so sweet and delicious. It was an epiphany-my pea epiphany. Now when I chat with members many have told me that their peas never make it back to the house- their children devour them on the ride home. Lucky kids! It’s a shame the pea season is so short, but for now we have quite an abundance (a pea preponderance). The English, or shell peas convert their sugars to starch very quickly so use them as soon as possible. If you do not eat them raw, steam or sauté them very lightly. The sugarsnap peas hold their sweetness much longer. It’s a wonderful share this week- we still have lots of beautiful greens and we have begun picking summer squash. We also have baby beets and elephant garlic for you. Elephant garlic is not a true garlic- it is more closely related to a leek. The bulb has a mild garlic flavor and can be used in dishes just like the regular stuff or roasted (whole in it’s wrapper) to make a spread. Since we harvest them green the stalk can be used as you would use a leek. Don’t forget about the Farm visit this weekend. We may have a passing shower or two but hey, it’s summer in the Northeast! There will be places to shelter from the storm. We are also asking for volunteers to help with the pea picking (9 AM-ish) before the visit begins at 11 AM. There will be other opportunities throughout the season to come out and lend a hand and to show you family where their food comes from. Posted 6/16/2017 5:22pm by Jeff Schrimmer. Well we’re havin’ a heat wave (in case you hadn’t noticed). While the workers are a little wilted, the soil fortunately has sufficient moisture that even the cool weather crops can tolerate the heat. And the warmth loving crops- tomatoes. peppers, squash etc., are looking great and are finally beginning to grow. I am pleased to proclaim that we are picking peas. They were planted a bit late but they have been thriving in the cool, moist spring we have had. It is with doubt the most beautiful crop I have ever grown. So while we must continue to hope and pray for a world of peas there will at least be plenty of peas in the share this week. I expect them to be abundant for the next 4 or 5 weeks, which is convenient since it will take me that long to use up all my pea puns and p-alliteration. Also new this week are garlic scapes- these are the flower tops of the garlic plant. They can be grilled, minced and sautéed, or blended with olive oil, nuts and cheese to make a basil –less pesto. They are said to have a mild garlic flavor, although personally I find them almost as strong as the bulb itself. We continue to have lots of gorgeous lettuce, spinach, herbs and other greens. We expect zucchini to begin next week and probably baby beets. And, yes kale (and broccoli) are coming soon. The growth of these crops was slowed by the brutal attack of the flea beetles, but they have overcome this adversity and are growing well. In the case of the kale I wanted to give it one more week to grow before we begin stripping all it’s leaf away. Don’t forget : the Farm visit will be Saturday June 24. It will be a pot luck barbecue with farm tours. The main day for CSA members will be Saturday, however if you cannot make it on Saturday you are welcome on Sunday the 25th . The share for this week will be: Red leaf or red romaine lettuce, arugula, either radishes or salad turnips, spinach, garlic scapes, either Sugarsnap or English (shell) peas, Swiss chard, choice of 2 herbs (dill, cilantro, garlic chives or mint). Posted 6/16/2017 5:17pm by Jeff Schrimmer. I apologize for being so late with the first update of the season. We have been working hard to get the planting done after a bit of a late start. In late February it seemed we would have an early spring but the winter came back with a vengeance. The big blizzard brought us nearly 2 feet of snow and then several weeks of rainy weather left the fields too wet to plow until early April. Since then the weather has been acceptable; a bit cool through April but with adequate rainfall. Due to the mild winter we are having more trouble than usual with our most pernicious pest- the flea beetle. They are small black critters which jump when disturbed- hence the name. They are specific to the brassica/ mustard family; lacing them full of holes to the point where they can actually kill a young plant. We try to cover as much as we can but there are acres of these crops in the spring and we had to use a lot of our Ag fabric to cover the onions, which has a new pest, recently emigrated from Europe. So, I am a farmer, specifically an organic farmer because I am an environmentalist. When I was in high school I read Rachel Carson’s “Silent Spring” and as a nature lover was alarmed at the havoc man was wreaking on the natural world. I became convinced we had to learn to grow our food in manner that did not contaminate the planet. As I learned about organic agriculture I also learned about the enormous energy inputs involved with modern farming and the question of sustainability; that now common and overused buzzword. Scientists were just beginning to sound the alarm bells about climate change. In the 90’s, it seemed that the evidence was solidifying and the world would begin to address this serious threat. I began to see another important role that organic farming had in protecting our planet- carbon sequestration. I predicted that with the carbon tax, i.e. cap and trade that farmers would be paid for increasing the organic matter in their soil. Well I was wrong about that, but not wrong about the importance of organic agriculture in combating climate change. In fact over the years research has been done and evidence is mounting that a shift to organic farming and to rotational grazing can not only mitigate the effect of carbon being released, but actually begin to reduce atmospheric carbon. In addition conventional agriculture allows the release of nitrogen in various forms that are more potent greenhouse gases than CO2. And now the environment is under attack; the current administration is trying to gut the laws that protect our air and water and reverse the progress that has been made over the last 40 years. And climate change denial will not only impede steps to reduce emissions but actually spur an increase. There is a political battle to be waged and I am sure that many of you have been to marches and are involved in other ways. But I believe that the economic power that we wield is even more powerful than the political power we have as voters and constituents. Local farmers have a huge role to play in environmental protection and they need support. Local organic producers are under attack as well, not only from bad government policy but from economic factors and social trends. CSA membership has been declining rapidly over the last 3 years as well as farmer’s market revenues. People are opting for convenience- home delivery or buying cheap California organic produce in the supermarket. We need your help. It’s hard to know how to advertise or promote these days but word of mouths remains the best option. It’s important that you talk to your circle of family and friends about supporting local farmers. CSA’s and buying direct at farmers markets are the only way to do that. Buying from coops, supermarkets, home delivery services or meal plans like Blue Apron only enriches the middlemen. Small local producers cannot make it on wholesale prices. In future update I will continue to expand on the theme of farming and the environment. The Farm visit will be on the weekend of 24th and 25th. Posted 1/28/2017 12:53pm by Judy Crane. 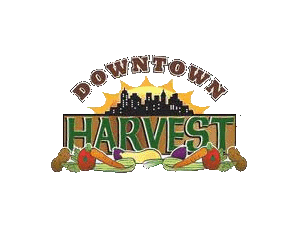 Downtown Harvest CSA is open for enrollment for the 2017 season, our 13th year! Posted 7/3/2016 5:23pm by Judy Crane. Posted 6/26/2016 11:39am by Judy Crane. So we continue to experience dry conditions here on the farm. We have had several more predicted rainfalls fail to arrive. We have another shot at a little precipitation overnight on Monday and perhaps a better chance of the wet stuff on Thursday. Keep your fingers crossed, say a prayer or perhaps do a rain dance if you are so inclined. In the meantime we will continue to move the sprinklers around the fields and employ creative tricks to get the seeds to sprout. This week’s share will be very similar to last weeks. We still have lots of spectacular spinach as well as escarole and frissee, so enjoy them now as they won’t be back until the fall. We have Swiss chard ready and a second planting of arugula for next week’s greens. We are still inundated with garlic scapes so we will send some more one last time. These will keep for weeks even months in the fridge so don’t feel the need to use them quickly. The broccoli and the peas on the other hand should be used as soon as possible; especially the English or shell peas. These turn starchy very quickly. We will begin to have more sugarsnaps (edible pod) soon and these hold their sweetness much better. The summer squash is coming in heavy now so there will be more in the shares. We are back to radishes for the root vegetable this week, except for those who did not receive their salad turnips last week. We will have beets for you next week. Broccoli is becoming abundant and if you did not get it last week you should see it this week. Those who received broccoli will get kale. The share for this week will be: Lettuce, summer squash, garlic scapes, radishes (or salad turnips), broccoli or kale, kohlrabi, spinach, choice of escarole or frissee, peas and choice of cilantro or dill. Posted 6/26/2016 11:36am by Judy Crane. So we waited with a mixture of anticipation and dread for the severe storms predicted for Saturday. We badly need the rain but worried about the high winds and potential for hail. In the end we got no rain at all, only 2 days of high winds that have been wreaking havoc with our crop covers and drying out the soil even more. There is some hope for precipitation at the end of the week; in the meantime we will be moving the sprinklers around from field to field to keep the crops growing and the seeds germinating. The good news is that the shares size will nearly double this week with lots of new crops beginning to mature. The broccoli has begun to head and we will send it to some groups as availability allows. Those not receiving broccoli will get kale for this week and broccoli next week or the week after. We will also be sending bunches of broccoli leaf which is almost as nutritious as kale and in my opinion more palatable. I sauté the leaf with onions and blend this with milk for a delicious base for cream of broccoli soup. Summer squash has also started to produce; small quantities for this week; more in weeks to come. We have peas, mostly English- the shell type. The sugarsnap peas will become more abundant in the coming weeks. For lettuce we have a speckled romaine-an heirloom variety called Forellenschlus. The heads are usually fuller but with the drought they may begin to bolt and will get bitter. Garlic scapes are here! These are the flower tops of the plant and can be grilled, chopped finely and sautéed or blended to make a pesto. Hakurei salad turnips are a sweet, baby size treat intended to be eaten raw, although many folks prefer to cook them. They have beautiful greens- great for braising or sliced into ribbons mixed into salad. The share for this week will be: Forellenschlus romaine, salad turnips, garlic scapes, spinach(2 bunches), broccoli or kale, summer squash, choice of escarole or endive(frissee), peas, bok choy and choice of cilantro or dill. Posted 6/5/2016 6:58am by Judy Crane. We finally got some rain here at the farm on Sunday, just over an inch. We need more but are grateful for what we receive. We have essentially lost the first planting of arugula, broccoli raab and tatsoi as a result of the dry conditions and the heat wave. It had been under siege from a pernicious pest-the flea beetle and was covered with an Ag fabric to protect it. Because it was hidden and because we are so busy with all our other planting I missed seeing that it was beginning to bolt to seed. We have another planting so perhaps we will have more in a few weeks, if not it is always much better in the fall. We will try to salvage what we can for this week. We do have beautiful spinach and lettuces and in the coming weeks there will be Swiss chard, escarole and frissee. The garlic scapes are late this year; we should have some next week. Peas will begin next week as well. It’s a small first delivery but it will be increasing substantially each week. 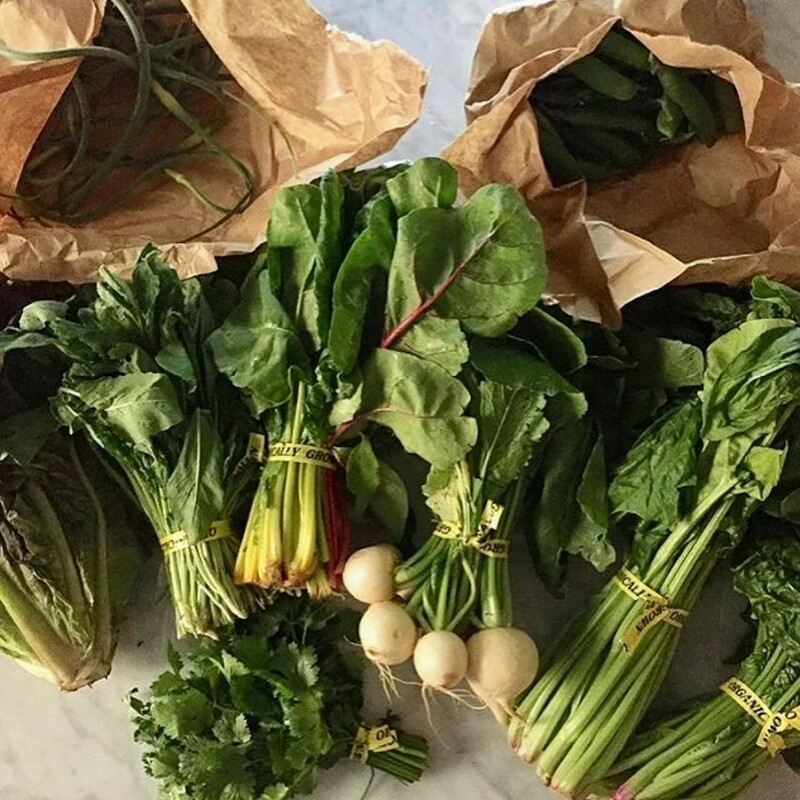 The share for this week will be: 2 bunches of spinach, 2 types of lettuce, radishes, arugula or tatsoi and choice of an herb (chervil, garlic chives or mint). We have sunchokes that we will offer as an extra.